I sat at the dining room table Sunday afternoon, notebook open in front of me and pen in hand, waiting for some ideas to come. After weeks of growing discontentment with our current routine and the attitudes in our home, especially surrounding chores and school, I was ready for a change. But what kind of change? I knew I had to set the tone with more positivity and a fresh atmosphere, so I set down a few ideas for adding positive reinforcement and a little more loveliness into our day. One of the problems we have been struggling with is in the area of completing our morning routine without dawdling and complaining. I created a little extra incentive chart for my son to do his morning jobs in a timely manner without my constant nagging. I also decided to back up the time I expect us to “start school” each day to stop us feeling so rushed. When I talked to my son about these changes, he was very excited and ready to try to get his tasks started in the morning. Since my own attitude is really the only one I can change, I also wrote down some very different priorities for the week in my planner. Instead of usual top 3 tasks for housekeeping and work, I wrote things like “Smile, laugh, and have some fun every day,” “Create something with your hands,” and “Love God and your family well.” I also reminded myself of the importance of getting my personal Bible study and prayer time in before the kids wake each day, so I set my alarm a little earlier for Monday morning. Finally, I resolved to infuse some fun and beauty into our homeschool routine so that we all have something special to look forward to each day. Over the past few weeks we added “Poetry Tea Time” back into our schedule once a week, and it had become a highlight for me and the kids. In my notebook, I wrote down plans for daily “tea time” at the beginning of the school day: light candles, set out the tea things and snacks, and gather at the table with smiles and anticipation of the good time we are about to have learning together. Finished with my brainstorming session, I pushed back the notebook and set down my pen with a satisfied sigh. I knew that none of these changes were big on their own. And I knew that none of them was a magic formula for success. But I also knew that because I was setting my intention to make positive changes and have a joyful attitude myself, things would be better. Because I was going to set the tone and prepare an atmosphere of beauty and goodness, our day would be different. I was hopeful. And, you know what? Today was the best day we have had in a very, very long time. I hope it is not the last… I don’t think it will be! How many quick wins will you have today? Click here to get the free printable list of the above 20 Quick Wins to help you make the most of your housekeeping time. It is formatted to print 3 lists on a page, so you can cut them apart and post them around the house where you will be able see them often. Happy cleaning! Welcome to the final installment (for now) in this series on Child Chore Training! Last week I gave specific examples of what this currently looks like in our home. 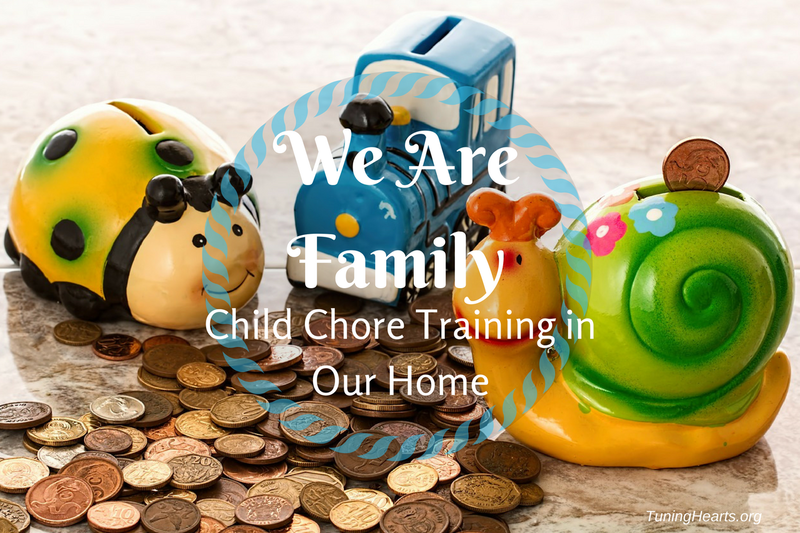 Today I want to share how and why we pay our children for doing chores. I guess we should start with why we chose to pay our son for his chores every week. First, we decided at age six he was ready to begin learning some basic money management skills. We want him to grow up with an understanding of how much things cost, how long it takes to earn enough money to actual buy something worthwhile, and how to save and give back to God some of his earnings. Also, even though he does chores because he is part of the family, we feel that paying him now gives him an idea of what it will be like to work for an employer some day. We told him early on that if he did not do his chores when asked each day, he would not get paid, just like an employee does not get paid when he or she fails to show up for work. So it is an additional motivational tool to get those chores done! Plus, our son is at that age in which kids start to want to buy things themselves, and his is into Legos in a big way. We have never been able or willing to buy toys just anytime throughout the year, saving those things for birthdays and Christmas. So now he knows that he can earn his own spending money and save it up for as long or short an amount of time as he wants before spending it on that new Lego set he has his eye on. But he already has learned that the longer he saves, the better! As to how we pay him, we started out with a rate of $.05/year of his age, so he is currently paid $.30 every Saturday. We will increase his pay as his responsibilites increase, probably right around his next birthday. I have sometimes allowed him to earn an extra nickel in the week if he has been especially helpful with extra chores that were not on his list. Yes, this is a small amount, but we do not have a big budget as a family right now, and he really does not NEED much of his own money yet anyway. It is more about the lessons learned than the money earned! Since part of our goal was teaching him how to manage his money, we divided up his earnings into three categories: spending, long-term savings, and offering. Because I did not want to be counting out strange amounts of pennies each week, rather than divide his $.30 into exact percentages, I simply put $.20 into his spending pouch and $.05 into both the savings and offering pouches each week. We found a set of 3 matching zippered pouches in the school supply section at Walmart last year, and they have been perfect for this purpose! In case you are wondering, my son is not allowed to spend from his savings until much later in life. This is truly meant for long-term savings and can only be spent on something big, like a car or college. We will eventually open a savings acount for him for this purpose. The offering money is supposed to go with him to church every week. You might not believe it, but he gets a real thrill out of putting that nickel in the plate eery Sunday! I cannot totally take credit for how we do this whole payment for chores thing, since I originally heard about it from organizing guru, Mystie Winkler of Simplified Organization. (That’s my affiliate link, by the way, because Mystie and her courses are AMAZING!) In case you want to hear how she and her family does it, here is her Youtube video “Paying Children for Chores“, so can get more inspiration! So, that’s it from me! Now I want to hear from you! Do you pay your kids for helping around the house? If not, do your kids get an allowance? I am curious to hear your repsonse!